On a small promontory stands the Butler Arms Hotel, guarding, it seems, both sea and lake, and famous for the produce of . . .
On a small promontory stands the Butler Arms Hotel, guarding, it seems, both sea and lake, and famous for the produce of both - a silver and shell fish abundance. 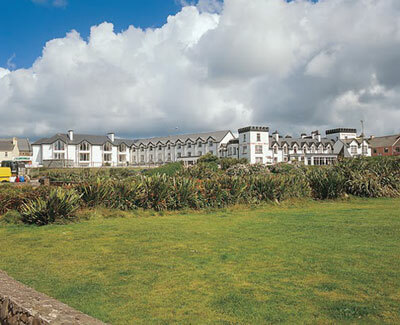 Butler Arms Hotel hosts comfortable lounges and 36 spacious bedrooms, many with stunning sea views. It also is home to a highly rated restaurant and the charming Fisherman’s Bar, which is noted for its own superb pub food and cosmopolitan ambience. Butler Arms is a great center from which to venture horse riding, rambling, climbing, sea-sports or the superb salmon and sea trout fishing for which Lough Currane is famous. A great location for golfers, with the world renowned Waterville Links course and the more recently opened Skelligs Bay course are just minutes away. Whether relaxation or adventure are what you seek as a traveler, Butler Arms is prepared to deliver with the highest level of service and comfort, to ensure the perfect vacation.